Still Have Questions about the eCourse? I’m an FAQ kind of gal, so I have lots of answers for you! Can I teach multiple children at the same time? Yes! The beauty of this course is that it was totally designed to be family-friendly. I taught six children, two at each level, at the same time for almost every lesson. There are special “teaching multiple children” sections in the course materials to give you ideas on the order in which to present skills so that one age level can be practicing while you are working with another age level. For almost every class, you’ll be able to juggle 2 or 3 age levels at the same time. And what they make usually ends up coming together to make one meal or snack that everyone can enjoy! See the Curriculum Map for the intricate module integrations to see what your kids might do! How do I decide on what module level to start my child(ren)? The best way to determine whether a child is Beginner, Intermediate, or Advanced is to peruse the Curriculum Map that lists the skills taught at each level. Some of the Beginner Level skills are appropriate for very young children, like ages 2-6 (i.e. careful pouring, building a colorful salad, spreading butter). Some of them are important foundations for any age, like peeling correctly, cross-hatch dicing, and measuring. The Intermediate Level lays very important foundations such as sharp knife safety and stovetop safety. If your child has never worked with a sharp knife or at the stove, then they are definitely at Intermediate or Beginner, no matter their age. If you’re unsure about their ability in those areas, you can always watch part of the videos from Intermediate class 2 and 5 and see how your kids fare. You can also pick and choose what classes to utilize and only teach a few from a level before moving on as well. I know of some young teens whose parents started them at the Beginner Level just for peeling and a couple of the other skills taught there. A teen could blow through those in combination with the Intermediate Level in a few hours. Many of our members with multiple children in the family have simply chosen to start everyone at the Beginner Level and move through all 24 lessons together. The bottom line is that your child’s experience, personality, and your tolerance for new things and risks will direct where you begin, and our course will take them from there! Consider it a prerequisite for Intermediate that the child knows how to peel vegetables, cut with a dull knife, and measure accurately. To move to Advanced, a child must have some experience with sharp knives and the stove, as well as cracking eggs and reading a recipe on their own. Lots of foundational skills at the Intermediate Level! Should I get one Level or All-Access VIP? Your child is an Intermediate or Advanced age but doesn’t have much experience in the kitchen (or could use some reminders). Your child is a Beginner who might want to learn more. You’d like your child to be able to complete lessons as they grow older. A 5-year-old could do the Beginner lessons this year, part of the Intermediate Level next year, finish that level the next and then move into the Advanced Level. As a VIP, you’ll never lose access to the course as long as it is online and can download the videos to keep permanently. You’ll want to consider the Concierge Experience if you’d like to get kitchen tools, non-perishable food items, and books in the mail and have official meeting times (to help you actually get the class done) and one-on-one Q&A opportunities with the teacher. Can I give the eCourse as a gift? Yes! We love it when grandparents or friends give our course as a gift, and many have. The easiest way to give the eCourse as a gift is to use the gift options provided during checkout. When you are asked to register for the course, don’t do it. Just forward the email from Katie Kimball with the subject “Claim Your Order so You Can Get in! [eCourse]” to the family who will be using the course. Our lesson reminder emails come from a different system, unfortunately, so if the family wants to receive those, someone needs to email [email protected] to change the email on that side of the account. If you want a gift certificate that you can print and wrap, shoot an email to [email protected] and we’ll be happy to send you one! I go to a charter school. Can my school pay for the course for me? Yes! If your school has a supplies budget in place (many do), I can work with you! If you don’t see your charter school on this list but you’d like to join using charter school funds, please share this link https://kidscookrealfood.com/charter­-schools/ with your school or email [email protected] with the school’s name and contact information and let us know you’d like to join. Can my kids do the lessons on their own? Maybe. The Kids Cook Real Food eCourse is a multimedia online course designed to help adults teach kids to cook (it doesn’t have to just be parents). Although older children could watch the videos on their own before working in the kitchen, it’s not intended to be fully self-study. An adult should always be involved once children are using knives, hot stoves and more. If your kids have experience in the kitchen, however, and you’re comfortable with them working while you’re simply nearby working on something of your own, I know there are members who have done this successfully with older kids. Is it appropriate for 2-year-olds? Absolutely. A 2-year-old might not be strong or coordinated enough to complete all 8 lessons at the Beginner Level but should be able to do quite a bit with an adult’s help and still learn valuable skills. By age 3, then 4, the same child could do the same lessons and get something new out of them! You bet! We have had a number of teens take the course so far, and nearly everyone had positive things to say. Because the course is made for children of such a wide age range, the tone of voice is a bit more for younger children, but the skills at the Advanced Level are exactly what a teenager should be learning (if they haven’t had a ton of kitchen experience before). As long as your teenager doesn’t mind hearing me talk to littler kids during the All-Kid videos sometimes, I think it’s a good fit. Can I invite others to join me for the classes? Can I use them in a homeschool co-op? Yes. In the terms and conditions it says it’s ok to teach any number of children. You may copy the memory tools for them but not the entire recipe eBook or lesson plans, and you can’t share the videos except for viewing them. This is awesome for inviting neighbors or cousins over to your house and also applies to homeschool co-ops where many families get together. The only thing members don’t have permission for is teaching others for-profit. That’s a separate Classroom Edition License. Please email [email protected] for details. 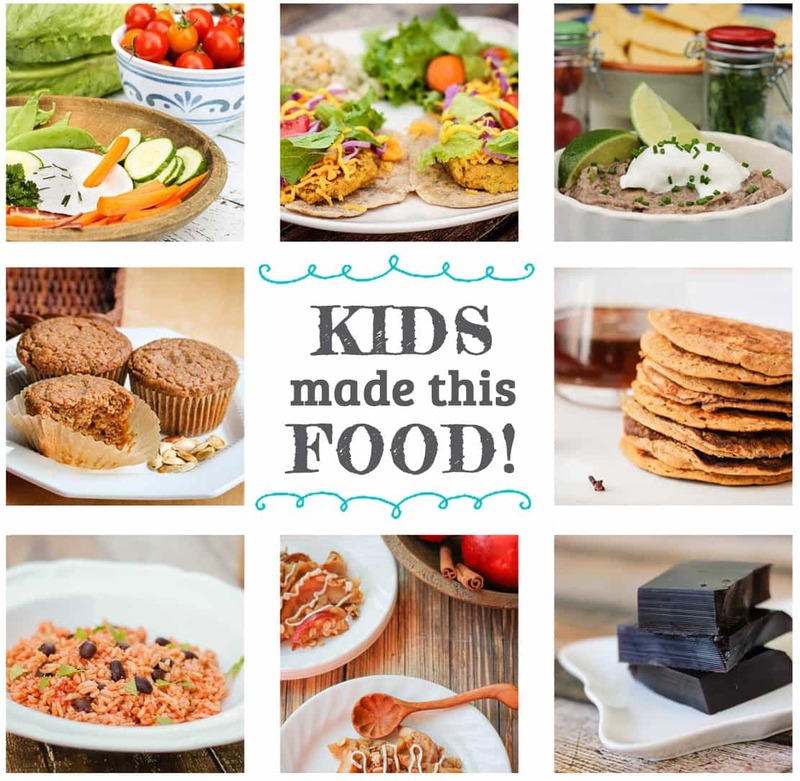 What kind of recipes are included in the Kids Cook Real Food eCourse? Oh, my friend. Delicious ones. And even more delicious because your children are making them. 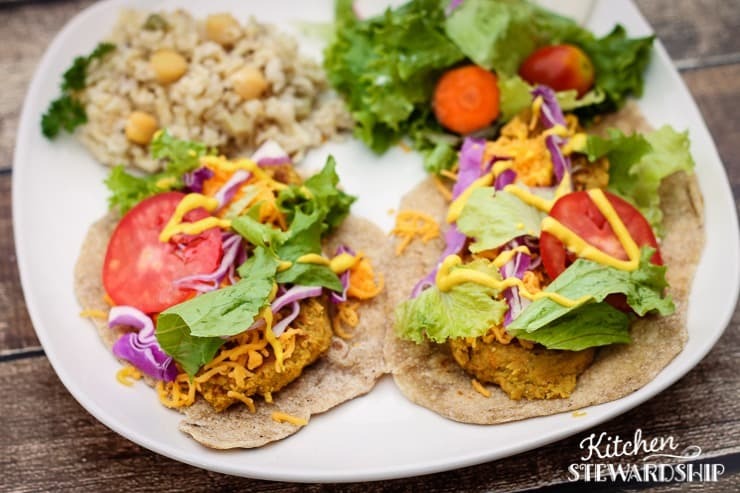 There are simple recipes like “potato hash” and “omelets” and more complicated things like homemade tortillas and meatless chickpea wraps (above). You can read all the recipe titles in the Curriculum Map. The most important part though? They’re all 100% real food, from scratch, no processed stuff. 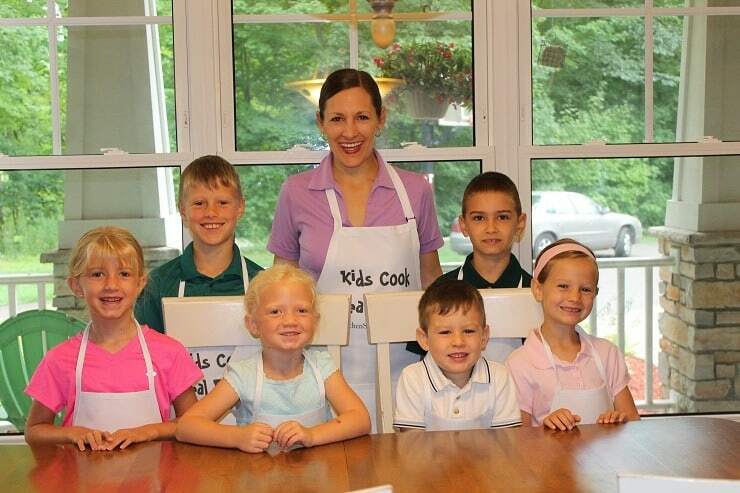 We teach kids to cook with fruits, vegetables, whole grains, eggs, cheese, meat (in one class) – the basics. The Recipe eBook is not just another “kiddie cookbook.” It’s packed with real recipes for the whole family to enjoy, as demonstrated in the video lessons of the eCourse. Will the eCourse work with my allergies or special dietary needs? The eCourse is very allergy-friendly and provides many substitutions for special diets! The beauty of this course is that the focus is on the skills, not the recipes. 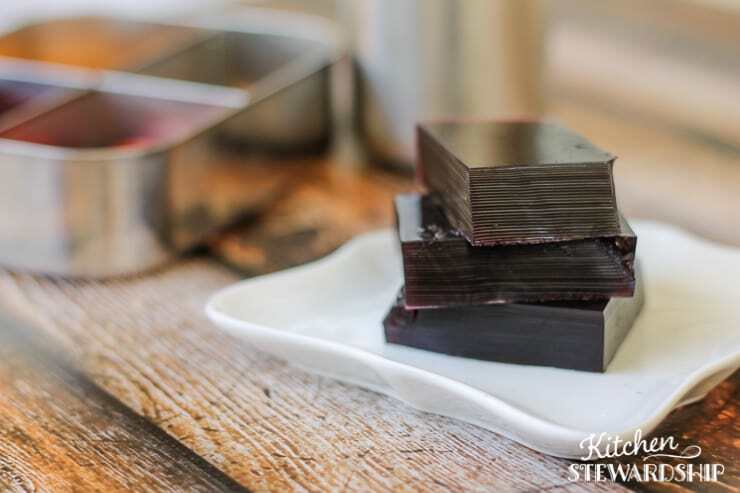 If someone in your family can’t or won’t eat an ingredient we use in the demonstrated recipe, it’s easy to swap it out for another recipe and still practice the same cooking skill. There is a section in every lesson plan with ideas for allergies and substitutions of many kinds. For example, we make ranch and Italian – the sour cream base for the ranch wouldn’t work for a dairy allergy or vegan, but kids could still make Italian, so the skill still gets appropriate practice. Our pancake and muffin recipes use eggs, but an egg-sensitive family could easily practice the skills of flipping pancakes and making a recipe all by oneself with any favorite pancake or muffin recipe. As long as the children won’t be traumatized by their experience not matching the videos exactly (we have a sensitive type here at the Kimball household, so I know how that can go), you should feel confident embarking on the course with any dietary restriction. Nuts: There are no nuts in the class recipes, and the one activity that uses peanut butter in a central way has many other options to practice the same skill. Gluten: All the recipes except two are already gluten-free, and both of those have GF alternative recipes, although that may shift the skill a little bit. Dairy: Many skills of the 30 already fit a dairy-free diet, and the few that don’t are fairly easy to adapt. Suggestions provided in the lesson plans. Eggs: Eggs are pretty central in about 2 out of the 24 lessons. There’s just no substitute for eggs when the skill you’re teaching is “cracking eggs” or “cooking scrambled eggs.” I still think the course would be worthwhile for kids with egg allergies – they’d only have to substitute 2 lessons max. Sugar: There is very little sweetener of any kind in the course, and you can use natural sweeteners like sucanat or honey or substitute your own recipes for muffins if you like. Vegan: All the skills in the Beginner Level apply fine to vegans, although 2 recipes would need adaptations. Two skills (eggs and ground meat) at the Intermediate Level would need replacements; suggestions provided in the materials. Two skills at the Advanced Level (cooking eggs and a white sauce) would also need replacements or adaptations (a dairy-free white sauce for example). I’d say that if there are 30 skills taught, only about 4 of them relate specifically to animal products. If you have other allergies, feel free to email a question to [email protected] and I’ll get back to you ASAP. If you get the VIP level with Facebook support version, I’d be able to help you find suitable allergy-friendly recipes to fit your needs for each skill as you work through the course. I’ve always been nervous about letting my kids use knives and the stove. How do I know this will be safe? Do I need any special supplies for the classes? Not really. There’s a supply list with every single item you’ll need for all 27 lessons, and it’s barely over a page of large text and includes items like “butter knife” and “large mixing bowl.” Most homes will have 90% of what we use already, and we recommend resources to purchase if you don’t. One necessary item for Intermediate and Advanced Level kids is a knife that fits your child’s hands. Any paring knife will do for the Intermediate Level, but the Advanced kids use a chef’s knife. You should have access to a sharp chef’s knife that’s no longer than 6 inches in length for best success with smaller hands (or something like a 4-inch Victorinox knife that can be used on many chef’s knife tasks). See our resources page for easy order links and ideas. If you would like to receive a box with all the supplies and non-perishables for Class 1 at all the levels, look into the Concierge Experience. What is the pace of the class? When will I receive access to all the lessons? The course is completely at your own pace, any time you’d like to login. I will send emails once a week for about 10 weeks as if the course was live and weekly, just a way to help keep you accountable and remind you that you have this awesome course at your disposal. You can stop those and start them over if you’re not ready to begin right away. I’ll also send reminders at key points of the year like school breaks to remind you in case you forgot you bought the class entirely! What does a whole lesson look like? An introductory video for adults explaining the day’s skills, how to present them in kid-friendly language, and some possible challenges you’ll want to be ready for. An All-Kid video for the kids that all levels can watch together. This is a skill that everyone can learn and sometimes integrates with the day’s lesson at age levels, sometimes does not. One video at each age/skill level, ranging in time from 3-22 minutes. If you have single module access, you’ll just have one of these. Otherwise, you’ll be able to watch all three. There are also 4 “Foundations 101” video lessons to establish basic skills before embarking on the course (or at least by Class 4), and if you’re a VIP or Concierge member, there’s a bonus 4-video Hospitality Class too. Single Level access includes the Adult Guide and All-Kid videos, plus the level you chose. A recap of what’s in the Adult Guide videos for those who would rather skim + planning helps for the All-Kid lesson and tips for teaching multiple age groups at once. An extensive lesson plan for each module level (usually 4-10 pages each). The day’s plan, supplies needed at a glance, extensions to practice the skill plus adaptations for allergies and more. Printable memory tools to help the kids (and parents!) remember the important key phrases in each lesson. There are 1-4 “Flash Cards” for each lesson plus a “Daily Nugget” card with the factoid nutrition lesson for the day. See an example of a lesson PDF from the Beginner Level to get a feel for the layout. What is included with VIP Access? With a VIP membership, you’ll have ongoing access to all three levels of this course, so you can use it at your own pace and move up through the modules as your kids grow up and learn new skills – it’s truly a one-time fee for something your family will benefit from forever. A Kids Cook Real Food Activity Booklet with worksheets to go with some of the lessons, a gift from Laura of Heavenly Homemakers ($5 value). You can upgrade a standard membership to VIP at any time once you’re in the membership area. How do I know this class will be any good? Truly, I am, and we also had an army of 40 reviewing families who ran the course through their real kitchens. We took that feedback and made massive improvements to what was already a comprehensive course. The videos were all filmed and edited professionally, and you’ll find the the PDF materials will answer all your FAQs before you ask them, even if you’re an FAQ person (which clearly you are, because here you are on the FAQ page). How much time should I set aside to teach the 8 lessons? With kids at one level, an hour should be sufficient for most lessons, although some of the cooking ones will take at least an hour and a half (kid-time is slower than adult-time, remember that). If you’re teaching all 3 levels at once, it’s totally doable, but you’ll need to set aside at least 2 hours so kids can rotate through the kitchen and not feel rushed. One class per week or every other week is just right for many families. Although there are technically 8 classes, many members split up some of them and teach part the first day and part the next, plus there are some bonus lessons, so it could take 10-12 weeks to fully complete. How much time does it take to prep the classes? For most people, looking over the lessons for about 15 minutes and making sure your grocery list is up to date will take care of it. Some folks really like to print, laminate, 3-ring punch, etc. That might a few hours up front getting everything prepared, and then just 5-10 minutes a week taking care of the details for each lesson. All memberships are lifetime access (i.e. as long as the course is online, minimum of one year guaranteed in the terms and conditions – but I sure hope it’s for years and years and years, I just can’t guarantee that I’ll be around for your “lifetime” legally, you know?). VIP and Concierge Experience members will have the ability to download the videos after the refund period is over. PDFs are always available for download. If you purchased before November 15, 2018: Your membership at the single or all-access level would be for 12 months. Lifetime upgrades available in the member area. Videos are not downloadable with a basic 12-month membership. Yes! Once you’re a member, there will be ways to upgrade at any point. There’s no “open” or “closed” enrollment inside the member area. Can I access the course or store downloads on multiple devices? You bet. Once you’re a member, you can login from any device, anywhere, to view the course materials, and if you download them, you are welcome to save them on any device you own. Starting when you receive access to the course (immediately after purchase), you’ll have 30 days (increased to 60 days at Christmastime!) to try out the course in your kitchen. We are so confident that you’ll love it that we will refund your digital purchase price if you email your request to [email protected] within the refund period. Flash drives include a $10 service charge to return and of course the product itself must be mailed back. The physical products in the Concierge Experience are non-refundable as food cannot be returned. Concierge refunds will be your total payment minus the cost of the physical products (subject to change). Can I download videos? PDFs? There is a member area for streaming the videos, so if you don’t have home Internet (or it’s not very good), you might have trouble watching them. If you get a VIP or Concierge Membership you can download the videos after the 30-day refund period is over. I recommend downloading at the lowest quality so it doesn’t take up so much space on your computer. The PDFs are always downloadable, no matter your membership level. Can I get the materials on a flash drive or DVD? Yes! We are offering flash drives for a small fee; watch for the opportunity to add yours at checkout. They are only available with VIP and Concierge memberships, however, because the drive has all the videos (in HD) and PDFs from every level. You can use the flash drive to watch the videos on Roku, AppleTV or FireTV as well as to access your course when you don’t have Internet. You may not share the drive with others; it’s still your membership. We don’t offer DVDs at this time. The Kids Cook Real Food eCourse was created by Katie Kimball of Kitchen Stewardship, along with 3 of her 4 children (baby Gabe didn’t get to participate but enjoyed eating all the fruit we cut up). I am a trained elementary school teacher with experience in 3rd and 5th grade classrooms. There’s nothing comparable to the positive peer pressure of seeing real kids doing the work of cooking, enjoying eating vegetables, and even making mistakes.